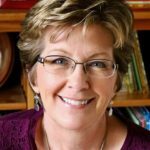 The Christmas Boot, Plus an Interview with Lisa Wheeler! And a book giveaway! Home Uncategorized The Christmas Boot, Plus an Interview with Lisa Wheeler! And a book giveaway! A new book from Lisa Wheeler is always a treat. But when I saw the cover of The Christmas Boot, I knew it was something special. I asked Dial for a preview, and they were kind enough to send an f&g. Oh, people. Besides feeling like a folktale we should already know but can’t quite recognize, this entire book is a visual feast. Words and pictures, together? They’ll warm you to your toes. JE: This is a new version of your original 2006 book with Mitten Press, right? How did that come about? Were there any revisions between the two versions? LW: The Christmas Boot has an interesting back story. It was originally published by a small Michigan-based house in 2006. That company went out of business, so the book went out of print. I asked for the rights back, and they happily obliged. My agent, who always loved this story, sent it to Lauri Hornik at Dial, and she made an offer. I, of course, was delighted that Jerry Pinkney, who is an amazing talented living legend in children’s books, was asked to illustrate. I felt like I won the picture book lottery! I had to do some minor revision between the two versions. Both are very similar to the manuscript that I originally wrote. 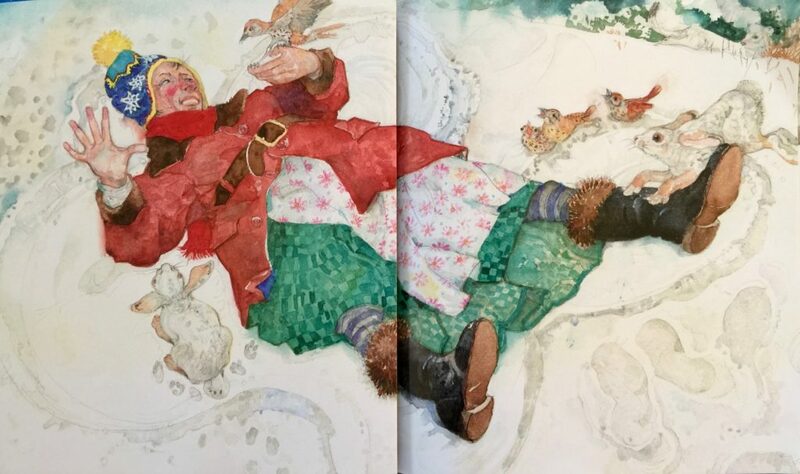 © 2016 Jerry Pinkney A joyful Hannah Greyweather, whose feet are toasty-warm at last, drops to make a snow angel. LW: I actually wrote this story in December of 1998. My dear friend, Linda Smith, challenged me to write something out of my comfort zone. One evening that December, as I got into my car after work, I saw in my mind’s eye a solitary black boot lying in the snow. I actually opened the car door to check and make sure I hadn’t passed one in the parking lot, because the visual in my mind was so clear. On my drive home I began asking myself who that boot belonged to, and that was how it all started. I sent the manuscript to Linda, as we often shared stories for critique. She loved it and encouraged me to send it to my agent. He loved it as well. The book went to acquisitions at two houses and was ultimately turned down by at least four houses – probably more, but it was so long ago that I cannot recall. I do recall someone saying that it “wasn’t a Lisa Wheeler book.” By that I assume they meant rhyming and bouncy and young. I tucked it away and tried to forget about it. Then in 2005 I met an editor from Mitten Press at a book signing. A few days later she wrote me and said they would love to work with me. She said they liked books with “nature” and did I have anything that might work for their house. I immediately thought of The Christmas Boot and emailed it to her right away. They made an offer and it was published with art by Michael Glenn Monroe in 2006. Unfortunately, when the recession hit, Mitten Press became defunct. Once again, the book was tucked away. In 2014, when my agent heard that Lauri Hornik was looking for a Christmas manuscript, he asked me to re-send him The Christmas Boot. The rights were once again mine and we were free to try and sell it. So we did! It now has new life breathed into it thanks to Jerry Pinkney, Lauri Hornik, Dial Publishing, and my agent, Steven Malk. JE: Wow. I can’t tell you how encouraging that is, to me and, I’m guessing, all writers reading this. I love the theme this story SHOWS so eloquently: the dichotomy between what we think will make us happy versus what we truly need to make us happy. Was that something you had in mind from the beginning, or was it something that presented itself as you crafted the story? LW: My friend Linda Smith, who originally challenged me to write this story (and who the book is dedicated to), was very ill as I was working on it. Because of her illness, I think I was in the frame of mind that “things don’t matter.” Linda was not a materialistic woman, and I like to think Hannah Greyweather honors her spirit. Plus, the fact that Hannah gets a puppy in the end would mean more to Linda than any fancy house. She was a huge animal lover! One more thing – at the time I wrote this book, I was working my sixth Christmas in a toy store. I saw lots of greed and commercialism and people who were completely stressed out over Christmas shopping. Maybe I was trying to say that Christmas would be more “Christmassy” if we focused on what really matters most. For me, that means being with the ones I love. JE: I couldn’t agree more. Thanks so much, Lisa, for sharing with us today the story behind your gorgeous book. Lisa’s website is here. Jerry Pinkney’s website is here. And click here to watch the lovely trailer for The Christmas Boot. With Thanksgiving approaching, those of you unfamiliar with Lisa’s not-to-be-missed Turk and Runt: A Thanksgiving Comedy … well, just go find it. You’ll be glad you did. Edited to add: Lisa has graciously agreed to send a copy of The Christmas Boot to one lucky commenter. Hope it’s YOU! Jill Esbaum is the author of many picture books. Her latest is How to Grow a Dinosaur. Other recent titles are Frankenbunny, If a T. Rex Crashes Your Birthday Party, Elwood Bigfoot– Wanted: Birdie Friends!, Teeny Tiny Toady, and I Am Cow, Hear Me Moo! Learn more at http://jillesbaum.com. Christmas books, Dial Books, Jerry Pinkney, Jill Esbaum, Lisa Wheeler, The Christmas Boot. Bookmark. Thank you Jill and Lisa. Lovely interview from two lovelies. (I’ve met both of you!) The Christmas Boot sounds and looks like the kind of seasonal story that should be on every bookshelf. Jerry Pinkney’s art is so fitting. I think I need this one! Love it. Thank you, Mona! I hope you like it. What a great story behind the story–to not give up on our manuscripts! Yes, Tina! Just to think that an idea I had nearly 20 years ago is a NEW book is amazing. Always a fan — thanks for your inspiring post! I’ve been a fan of Lisa’s, too, since I first started out. She’s definitely an inspiration! This book is definitely on MY Christmas list. Congratulations, Lisa, and kudos for your perseverance. Your words and Jerry Pinkney’s art will be a gift to many year after year, and the backstory is an inspiration as well. Awww. . .that is so sweet. Thanks, Sue. Wow! Congratulations, Lisa! It looks like a gorgeous book. Thanks Jill and Lisa for sharing the story with us! Thank you, Wendy! Just glad the book found a good home. I love how this book has been brought back into print! So many wonderful books have been lost to us because they are out of print. Thank you for sharing about this lovely book! Can’t wait to read it! Thanks, Angie! I hope I don’t disappoint. Hey, Lisa — so great to have you here at PBB! Love the back story–how great that an out of print book has been revived, with illustrations by Jerry Pinkney no less! It looks beautiful, and I love the message. Thanks for the great interview, you two. Hi Linda! So good to “see” you here as well. I feel very lucky that this book has had such a long and interesting life. Thank you for sharing this book, Jill. I love Lisa’s work and can’t wait to get this one! I also love Turk and Runt and already have it out to share with my little guy for Thanksgiving. Thanks, Traci! Turk and Runt still cracks me up after all these years. Amazing story. All those ups and downs. Thanks for sharing! Thanks for reading my saga, Eve! Hope you like the book. 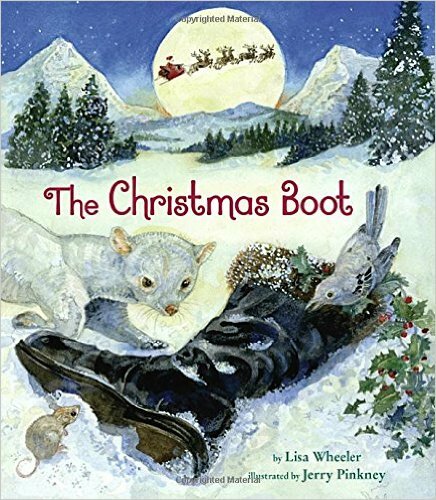 Thank you for sharing about Lisa Wheeler’s “Christmas Boot” and interviewing her. Thank you, Lisa, for sharing the backstory for the “Christmas Boot.” How exciting that you’re able to reprint it with a new illustrator. I love your writing! Thank you, Joan! Yes–the take away is never give up. Write from the heart, work hard and keep trying and you never know what will happen. Thanks for the great interview, Jill! I’m a fan of Lisa’s rhyming books, especially Sailor Moo & Avalanche Annie. This one looks absolutely stunning with Jerry Pinkney’s illustrations! Looking forward to reading it! Loved hearing the backstory too! I’d add Sixteen Cows to that list. Thanks for reading, Maria. Thanks, Maria! I love that you love my work!! Thank you for sharing! I love the message that some manuscripts just need more time to marinate before they find the right home. I can’t wait to check this one out, and am putting Turk and Runt on my hold list right now. Thank you, Lindsay. “Marinate is a great way to describe it. Hope you enjoy T&R. Thank you for the inspiring interview with Lisa. I’m excited to read The Christmas Boot. So nice to know that some of our stories won’t die but simply hibernate until it’s time to re-appear! Yes, Judy! Hibernation plus marination spawns creation!! Thanks for reading, Cindy. I’ve waited years to share the story-behind-the-story. Glad it had a happy ending. So inspiring!! Thanks for sharing! Glad you’re inspired, Kris! Hope you enjoy the book. Thank you both for this inspiring interview and sharing the journey of a beautiful book. I can’t wait to read it! And I hope I don’t let you down, Anne. Happy reading! Thank you, Lisa, for working on bringing this book back. The story and illustrations are wonderful!! Thank you, Dorothy. Wish I could take credit for the illustrations. It is so wonderful to see how my words inspire a true artist. Wow! What lovely responses to my interview! Thank you, Jill, for thinking of me and The Christmas Boot for Picture Book Builders. I am honored. What a heartwarming interview with two lovely ladies! I thought I owned all of Lisa’s books so this one is new to me. It’s on my wish list for Christmas! Thx for sharing how this story was determined to be shared!! Hope you like it, Angie. It just came out so you didn’t miss it. Merry, merry! I, too, fell in love with this story when it was sent to me for review. I was inspired to outline it and teach myself ‘structure’ and in doing that knew exactly what to do on my own Christmas story. Oh, and Turk and Runt is a must read! it’s hilarious. Even though it’s been around awhile, I reviewed it in California Kids magazine. I re-read it every year, its so good. That is so sweet of you to say, Susan! And thanks for reviewing my books. That is a skill I do not have. Lovely! So glad it is back in print and with a GREAT illustrator, ta boot! Hugs. Thanks, Shutta! I agree. Jerry Pinkney is amazing! How wonderful to hear this story of a picture book that got a second life. Plus, I love the image of the boot coming to you so clearly…makes me think of Elizabeth Gilbert’s book Big Magic, where she talks about ideas flying around, looking for writers to write them. Thank you, Nell. That is exactly what it’s like! Elizabeth Gilbert totally gets it. This looks like just the scrumptious sort of book I would love–and your journey to publishing it is inspiring! Thanks, Stephanie. Take that inspiration and pass it on! Thank you for sharing Lisa! Your perseverance over so many obstacles with this story is so encouraging. I can’t wait to read it! Also….I adore Turk & Runt! Turk and Runt love you, too, Emily! 🙂 Hope you enjoy the book. This book is just as lovely as the author! I had the joy of working with Lisa at a Highlights workshop a few years ago. Hi, Kathy! So great to see you here. Can I tell my family that you said I was a joy? Ha-ha! Thanks, Judy! I definitely own the illustrator lottery!! Looks like a perfect “Grandma-reading” book!! Thanks, Mary. I am still hoping to be a grandma some day (soon please!) so it is so nice to hear you say this. I can’t wait for this book! I just love the back story and the sentiment of the story. 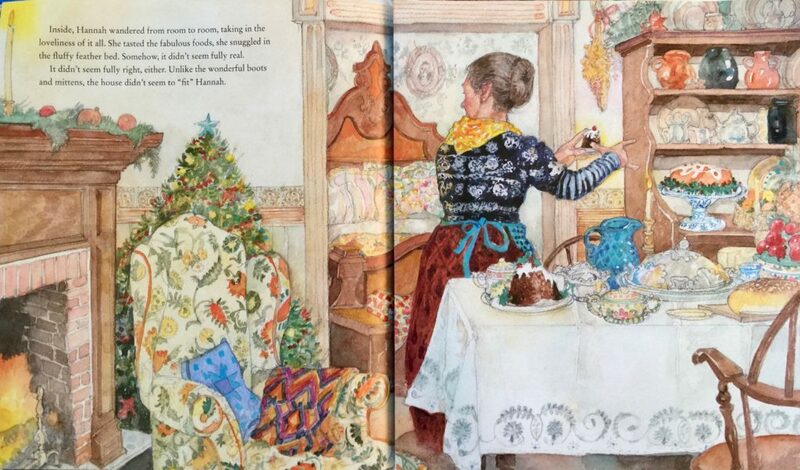 The illustrations you shared make me feel cozy just like a Christmas book should! And on top of that, I’m a HUGE Lisa Wheeler fan. Thanks, Penny! I feel so honored that you are a fan. Makes my heart happy. This is definitely the kind of Christmas story I want to share with my family. Not to mention how inspiring its backstory is to any writer with a story that takes a while to find a just the right home and time. This looks amazing! The illustrations are just beautiful! Wow! Gorgeous illustrations and what sounds like a great plot. I look forward to reading this one. How exciting! I love Lisa Wheeler books and am glad to see this one in print. And to have Jerry Pinkney do the illustrations…how cool is that? I can’t wait to get my hands on this one. Lovely, Lisa! I’ve been a fan of yours for a long time. Love your books as well as Linda’s. This looks like another wonderful Lisa Wheeler title. What an amazing and inspiring story! What a wonderful interview! It’s so full of heart-warming information and love. This is a perfect book for everyone! Thank you, Lisa and Jill! Ha…Dynamic duo – love you both Lisa and Jerry … rich language & beautiful illustrations… cherishable for every family! I can’t wait to have one in my hands!